My family and I spent the weekend exploring Antelope Island out in the Great Salt Lake. We had a fabulous, refreshing time (To read our full experience click here). 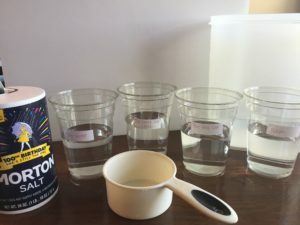 Our trip brought us home $30 poorer and a new science experiment to try. As we walked around the beaches of the Great Salt Lake, we told our boys that if they went swimming in the Lake, they would not sink. They looked at us like we were crazy and began their reasoning why that wasn’t possible. Walk out in the lake deep enough that their bodies could float without touching the bottom. In the beginning, they didn’t accept our challenge because the water was cold and we didn’t have swimming suits (IT WAS COLD). I reassured them that we had extra pairs of underwear they could change into, and to not use that as an excuse (they looked at me wondering if I was serious…) My second child decided to accept the challenge. The chain of events followed. My oldest couldn’t have his little brother show him up, so he accepted too. The biggest surprise was my 3rd child accepting the challenge. He made it known that he was saving his money for an awesome Lego set, and needed the money! We rode our bikes down close to the water and the boys stripped down and began walking out into the water. Because the lake is so shallow, they had to go out pretty far just to get the water up to their knees. Before I knew it my second second son, fell back into the water and laid there for a minute. I couldn’t believe it. I jumps up and starts running out of the lake screaming, “YOU OWE ME $10!!”. We were laughing so hard. 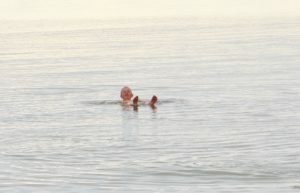 I asked him if he floated and he affirmed he never touched the bottom of the lake when he fell. I was surprised. He wasn’t that deep, he fell straight back and never touched the bottom! Crazy! My other 2 boys slowly made their way in and quickly made their way out all the while reminding us we owed them $10! WARNING: The water stings! My boys had a freak out moment as they got out because the salt water stung their legs! Once they are dry, the sting goes away. We decided we wanted to go home and test how much salt is needed to make one float! We made our experiment simple. Instead of a human we used an egg. Here is what you need. 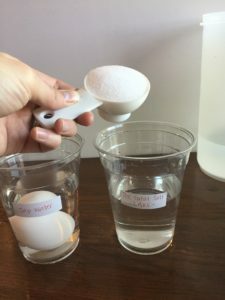 Step #3 – Pour the correct concentration of salt into each cup. We researched this a little bit. The Great Salt Lake is 6-27% salt water. We decided to represent the higher concentration and put in 1/4 cup of salt into The Great Salt Lake cup. The Dead Sea is 36% salt water. 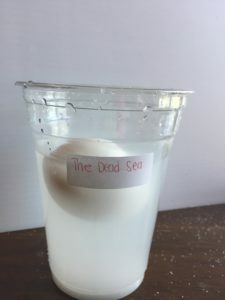 We decided to put in 1/3 of a cup of salt into the Dead Sea cup. The last cup is the Ocean. 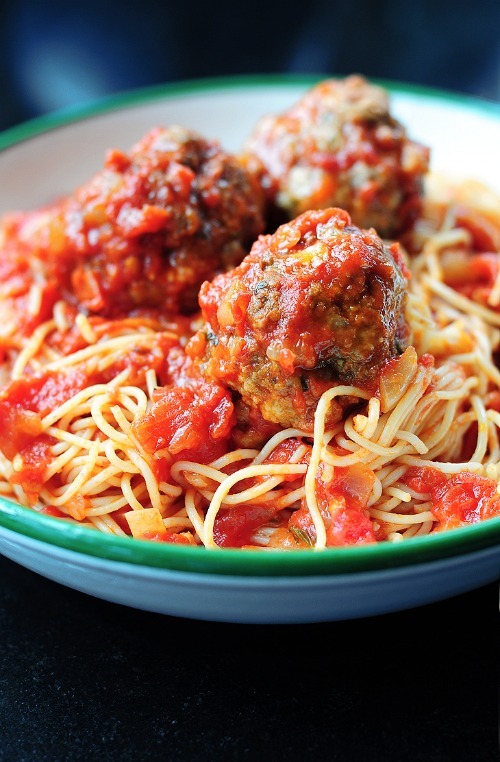 The Ocean has about 3.5% salt content which equals about 1/2 tbsp of salt. My boys couldn’t wait til the Dead sea salt was dissolved. There was a lot of salt. My boys placed the egg in the tap water. It quickly sinks to the bottom of the cup. 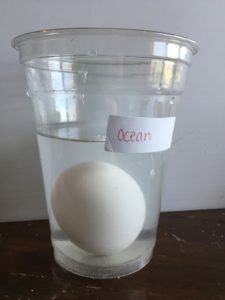 They then transfer the egg to the ocean. The egg slowly drops to the bottom but not as quickly and with a little bounce at the end. 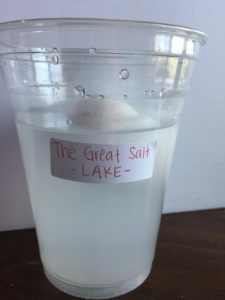 The next cup was the Great Salt Lake. My son dropped it in and it hit the bottom of the cup but it floated itself back up to the top. The last cup was the Dead Sea. My son dropped int in from the same height and it never hit the bottom cup. It popped quickly back up to the top. My boys thought this was fascinating. We talked about density and the human body is less dense that The Great Salt Lake, which explains why we float. 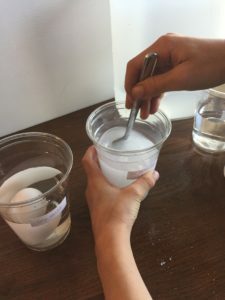 We then got another cup and slowly added salt to see when the egg would start floating. 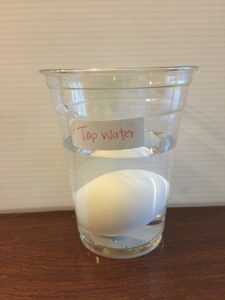 It only took 1 Tbsp in 1 cup of water for an egg to float. Needless to say my boys loved it! Make life all about learning! Your children learn by example! Become fascinated in the world around you and it will pass onto your kids. Enjoy!